Trucks are divided into light-duty, medium-duty, and heavy-duty classifications depending on their weight. Heavy-duty trucks have a gross vehicle weight of 33,000 lb (15,000 kg) or more (i.e. the weight of the vehicle plus the weight of the payload is 33,000 pounds or more). When a heavy-duty truck is pulling a trailer, it may have a gross combination weight of 80,000 lb (36,360 kg) or more. Technically, a vehicle that carries the load by itself, without a trailer, is known as a truck, or a straight truck. Examples include certain dump trucks, concrete mixers, and garbage trucks. A vehicle that pulls the load in a trailer is known as a tractor. The tractor is coupled to the trailer through a pivot point, known as the fifth wheel, which is mounted on top of the tractor frame. Most of the big rigs on highways are tractors pulling trailers. 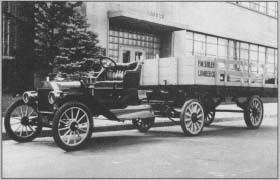 The first gasoline-engine trucks were developed in the United States in the 1890s. During World War I, trucks played an important role moving supplies at home and overseas. With the development of a system of paved roads in the United States during the 1920s, the number of truck manufacturers grew. By 1925, there were more than 300 brands of trucks on the road. Some manufacturers came and went quickly. The Great Depression of the 1930s finished many more. By the 1990s, there were only nine heavy-duty truck manufacturers left in the United States. Together they build about 150,000-200,000 trucks a year. Trucks use steel for strength and durability, aluminum for light weight and corrosion resistance, polished stainless steel for bright finishes, and molded plastics for complex shapes. Frame rails and crossmembers are usually formed from high-tensile steel. Suspension components, axles, and engine mounts are also made from steel. Some are cast and some are fabricated and welded. The cab structure and outer skin may be made from steel or aluminum. If steel is used, the metal is coated with one or more layers of corrosion barriers such as zinc. On some cabs the roof may be made of fiber-glass to form the complex curves required at the corners. The hood and front fenders are usually molded in plastic or fiberglass because of the complex aerodynamic shapes. The front bumper may be stamped and drawn from steel or aluminum, or it may be molded in plastic and backed with a steel substructure. Bright trim pieces—such as outside mirrors, sun visors, radiator grilles, and grab handles—are often made from polished stainless steel to give a long-lasting bright finish that will not crack or corrode. The cab interior is finished with vinyl or cloth upholstery. The floors are covered with synthetic fiber carpeting or rubber mats. The dashboard and interior trim pieces are molded from plastic. The windows are made of laminated safety glass. Fluids used in heavy-duty trucks include diesel fuel, petroleum-based or synthetic lubricants, antifreeze, power steering fluid, and an environmentally safe, non-fluorocarbon gas known as R134A, which replaces freon in the air conditioning system. Truck manufacturers usually design a new model about every five to seven years. The new design incorporates advances in technology and materials, as well as changes desired by the customers. The design team will use a clay model to determine the overall styling, then build a prototype cab and hood for review and durability testing. As the design progresses, they will build an entire prototype vehicle for road testing. Just before the new truck goes into production, they will build one or more pilot models using actual production parts to spot any last-minute assembly problems. In addition to the basic model, the engineers must also design all the options required by customers for different truck applications. Some manufacturers have as many as 12,000 options for their line of heavy-duty truck models. Heavy-duty trucks are assembled from component parts. Each truck manufacturer usually builds its own cabs, and a few also build their own engines, transmissions, axles, and other major components. In most cases, however, the major components (and many of the other components) are built by other companies and are shipped to the truck assembly plant. In most plants, the trucks move along an assembly line as components are added by different groups of workers at successive workstations. The truck starts with a frame assembly that acts as the "backbone" of the truck and finishes with the completed, fully operational vehicle being driven off the end of the assembly line under its own power. A 1911 Ford Model-T/Smith Form-A Truck Conversion tractor coupled to Fruehauf's 1914 flatbed semi-trailer. Today's most recognized form of heavy-duty truck, the tractor-trailer, or semi truck, was commercially developed in the 1910s. Some truck designers believed tractors, motor trucks designed only to pull separable trailers, could make truck operation profitable. If tractors easily connected to trailers, the more costly motorized tractors could remain busy hauling full trailers, while leaving less expensive trailers idle during loading or unloading. In 1911, truck designer Charles Martin built a gasoline powered tractor to pull modified horse-drawn commercial wagons. His most significant innovation, however, was the fifth wheel coupler. A round plate with a central hole, it attached to the top of tractor frames to connect and support trailers. Buyers converted wagons into semi-trailers by raising them with jacks and removing their front axles. 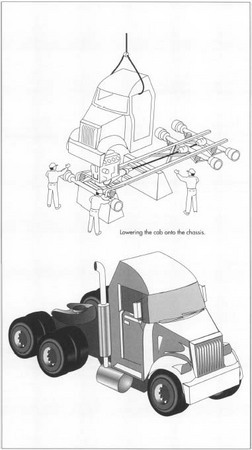 Lowering and locking a trailer's bottom mounted kingpin into a tractor's fifth wheel coupled the vehicles. Martin's Rocking Fifth Wheel handled the period's rough roads. It allowed tractor-trailers to bend when turning, but also accommodated the ups and downs of uneven surfaces. Nearly every truck manufacturer purchased Martin's popular device. August Fruehauf, a Detroit blacksmith, launched an early trailer manufacturing company in 1914, by building a boat trailer for local lumberman Frederick Sibley. Sibley pulled it with a Model-T Ford car that he turned into a one ton truck with a Smith Form-A Truck conversion kit. Impressed that pivoting tractor-trailers maneuvered long, heavy loads through tight quarters, Sibley ordered more trailers for his business. By 1916, Fruehauf was a noted trailer manufacturer. 1 A pair of frame rails are selected from stock lengths of C-channel. They are laid side-by-side and fed through an automatic drilling machine or punch to make holes for connecting crossmember brackets, engine mounts, and other frame-mounted components. A computer tells the machine the size and location of the required holes along the length of the frame rails. 2 Small threaded studs are spot welded inside the C-section of the frame rails. The air lines for the brakes and the electrical wires for the lights and sensors are placed inside the frame rails and are secured with rubber-cushioned clamps fastened to the studs. 3 The brackets for the frame crossmembers are bolted in place using high-strength bolts or self-clinching fasteners. The left and right frame rails are then positioned opposite each other, and the cross-members are added. The frame now resembles a long ladder with the rails as the sides and the crossmembers as the rungs. 4 Other frame-mounted components—such as engine mounts, suspension brackets, and air tanks—are bolted in place. 5 The front and rear axles are fitted with the proper hubs (the round ends to which the wheels are attached), brakes, and brake drums. The axles are clamped to the suspensions by means of long u-bolts. Some suspensions use long leaf springs while others use inflated rubber air bags. 6 The front and rear axles and suspensions are lifted into place and attached to the suspension brackets on the frame. The shock absorbers are attached between the axles and the frame. 7 Up until this point the frame assembly is usually moved from station to station either manually or with overhead hoists. The frame is now placed on a moveable support and begins moving down the assembly line. The air tanks and brake chambers are connected to the air lines, and the lights and sensors are connected to the proper wires. 8 If the vehicle is to be a tractor, the fifth wheel is lifted onto the frame and bolted into place. From this point on the frame assembly with the axles, suspensions, and frame-mounted components is referred to as the chassis. 9 All components that are not to be painted are covered with masking tape or paper. The chassis then moves into a paint booth where it is painted with compressed air spray guns. Most truck manufacturers require that all component parts be received with a primer coat of paint, so priming is not necessary. 10 After the chassis has been thoroughly painted and visually checked, it moves into a drying oven where a flow of hot air dries the paint. As it emerges from the oven, the masking tape and paper are removed. 11 The engine and transmission are brought into the plant alongside the assembly line. Almost all trucks now use diesel engines. The clutch is installed and the transmission is bolted onto the rear of the engine. The fan, altemator, and other engine components are installed and connected with hoses and electrical wiring. 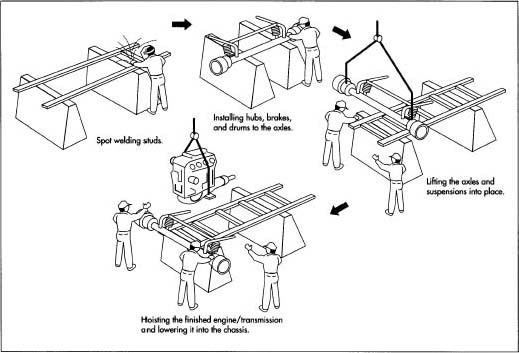 12 The finished engine/transmission package is then hoisted using lifting eyes that are part of the engine and is lowered onto the engine mounts in the chassis, where it is bolted in place. The radiator assembly is bolted onto its brackets ahead of the engine. The fuel lines, air hoses, starter cables, and coolant hoses are connected to the engine. 13 The fuel tanks are secured to their frame brackets and connected to the fuel lines. Batteries are secured in the battery box, but are not connected to prevent accidental sparking. line. Aluminum wheels are left natural or may be polished. Steel wheels are painted before the tires are mounted. The tires and wheels are mounted on the axle hubs, and the lug nuts are tightened. At this point, the truck is taken off its moveable supports and sits on its own tires. 15 The cab and sleeper substructures are welded or fastened together in jigs to hold the pieces in place. The substructures give the cab and sleeper their strength and provides fastening points for the outer skin and the inner upholstery and trim. 16 The outer skin pieces are welded or fastened in place. This includes the sides, back, floor, and roof pieces. The joints between pieces are overlapped and sealed to prevent leaks. The cab and sleeper doors are secured to the hinges. 17 The hood is usually a molded plastic piece and is shipped to the plant without any hardware attached. The hood is checked for rough surfaces and is sanded as required. 18 The cab, hood, and sleeper for each truck are painted at the same time. The surfaces are cleaned and the areas that are not to be painted are masked off with paper or tape. If a paint design such as a different color stripe is specified, the stripe area is painted first, then the stripe is masked off and the main body color is applied on a second pass through the paint booth. After each pass, the cab, hood, and sleeper go through a drying oven. After the final pass, the masking is removed and the paint is visually inspected. 19 The grille, headlight brackets, hood hinges and latches, and the manufacturer's emblem or name are installed on the hood. The finished hood is then stored alongside the assembly line. 20 The exterior components of the cab and sleeper—the grab handles, mirrors, visors, etc.—are mounted before any work on the interior begins. 21 The instrument panel is attached to the dashboard. The gauges, warning lights, and switches are installed and hooked up to the appropriate wires and hoses. The entire dashboard assembly is then installed in the cab along with the cab heater system and steering column. 22 Pads of foam insulation are placed in the cab and sleeper walls, and the interior upholstery pieces are secured in place on the walls and ceiling. Plastic trim pieces are screwed in place to cover exposed edges and seams. The floor is covered with a rubber mat or fabric carpet laminated to a sound-absorbing pad, and the edges are secured. The seats are installed on top of the floor covering and secured with bolts into the main cab structure. 23 The windshield and rear windows are carefully pressed into place. A rubber gasket seals the edges between the glass and the cab structure. 24 The completed cab is lowered onto the chassis and bolted to its mounts. The sleeper is bolted in place behind the cab. The steering column is connected to the steering box. The transmission shift lever is installed through the floorboard, and the clutch pedal is attached to the clutch linkage. 25 After all the cab connections are made, the hood is lowered onto the chassis and secured to its pivot point. The bumper is attached to brackets on the frame. Wire connections are made for the headlights and front turn signals. 26 The engine, radiator, and other reservoirs are filled, and the air conditioning system is charged. A small amount of diesel fuel is added to the tanks to allow a short road test. The steering wheel, which had been left out to give working room in the cab, is now installed, and the batteries are connected. The completed truck is then driven off the end of the assembly line. 27 To make sure that the front and rear axles are parallel to each other and perpendicular to the centerline of the frame, the truck is placed on a laser alignment machine and the axle positions are adjusted as required. The angle of the wheels is also adjusted. This ensures that the truck will handle properly and have satisfactory tire life. 28 The truck is driven onto a dynamometer and secured with chains. The rear wheels of the truck sit on rollers set into the ground and connected to the dynamometer. As the truck engine spins the rear wheels on the rollers, the dynamometer measures the engine power to ensure it is operating correctly. 29 The truck is driven slowly through a water spray booth as the driver checks for cab leaks. The driver then takes the truck out for a short drive to check out the overall operation. If the truck passes all the tests, it is parked on "ready row" to be delivered to the dealer. In addition to testing the completed truck, each component part and assembly operation is inspected. Parts are checked for correct dimensions before they reach the assembly line. Assembly operations are checked by the production workers themselves and are double-checked by quality control inspectors. The instrument panel is tested to make sure all the gauges and switches are working before it is installed in the truck. Even the thickness of the paint is checked with an electronic meter to ensure it meets the standard. Heavy-duty trucks have evolved slowly over the last 100 years and will probably continue a slow evolution in the future. An increased concern about fuel efficiency has led to more aerodynamic designs. Likewise an increased concern about exhaust emissions has led to cleaner combustion engines. Heavy-duty trucks are still one of the most economical ways to ship the wide variety of raw materials and finished goods needed in our complex society, and they will probably remain one of our principal forms of transportation for many decades to come. Karolevitz, Robert F. This Was Trucking. Superior Publishing Company, 1966. Rasmussen, Henry. Mack: Bulldog of American highways. Motorbooks International, 1987. Rasmussen, Henry. Peterbilt: The class of the industry. Motorbooks International, 1989. Freightliner home page. 1996. http://www.freightlinertrucks.com (July 9, 1997). Kenworth home page. 1996. http://www.paccar.com (July 9,1997). Peterbilt home page. 1996. http://www.peterbiltmotors.com (July 9, 1997). Volvo GM Heavy Trucks home page. March 18,1997. http://www.volvotrucks.volvo.com (July 9,1997). How about a high mounted running / brake light attached to the center-back of the roof of the cab similar to the high-mounted brake light on cars or vans. I was driving the highway in a rainstorm behind a truck without a trailer and could not detect the rear running / brake lights on the truck with all the road spray...dangerous. See and be seen.